Summer Music Fests: Which is the Best Bang for Your Buck? Austin City Limits is the best-value music festival. We evaluated it in comparison to two other major late-summer fests: Lollapalooza and Outside Lands. Outside Lands isn’t a good deal if you’re not into Paul McCartney. The former Beatle’s regular concerts are valued at $154.33, double that of the next highest-value artist, D’Angelo. This year, Lollapalooza’s highest value artists are often EDM artists. Lollapalooza began as an alternative-rock and hip-hop festival, but, in 2013, it’s often the DJs who are the best bang for your buck. It’s officially summertime, which means we’re all making plans for a big vacation. For many of us, that includes three days at a major summer music festival. All that frivolity, of course, comes at a price. For most, it’s a heft sum for a 3-day pass, around $200 to $250. So, you may be wondering: Is it worth it? What bands will a festivalgoer see? We assumed that you would see bands on a main stage or the biggest side stage – the most popular bands. How many bands can you realistically see in a day? We assumed you would be in the park from the beginning of the day to the end. How valuable is a band’s festival set? We measured a band’s value with average ticket prices from their most recent headlining tours. We also kept in mind that a festival set is often shorter than a regular club show. Below, after we explain how we arrived at these numbers, we take a closer look at each music festival and evaluate the value of a 3-day pass. For most festival-goers, that’s a question of who the headliners are and what the genre mix looks like – if the bill is heavy on electronic dance music (EDM) artists, indie-rockers or something else entirely. Finally, toward the bottom, you’ll find a table with the value of every band on every lineup, ranked from highest value to lowest, so you can calculate the value of your own festival experience. In estimating the value of each festival, we simulated the festival experience of your typical concert-goer. Rather than aggregate the value of all bands on the lineup, which would, of course, exaggerate the value of a ticket, we found the value that most festival-goers experience: they see the more popular bands – on the main stage – and they often stay in the park all day to squeeze the most out of that 3-day pass. Further detail on the numbers is below. We compiled ticket prices for each artist’s upcoming shows or most recent shows and averaged those prices to find the act’s average value. Where available, we included service fees as well. This pricing information was collected from Ticketmaster, Live Nation, Ticket Web and Ticketfly, among other venues. We assumed that our festivalgoer would attend shows at a main stage or the largest side stage. At Lollapalooza, for example, that was the Red Bull Sound Select stage and the Lake Shore stage. If a main-stage set and side-stage set overlapped, we assumed our festival-goer would be at the main stage. For festivals that had not yet released their schedules, we projected 2013 set times with those of the previous year. This method is in keeping with the following rule of thumb at festivals: more popular bands, who are higher on the bill, play later in the day and on the main stages. We thus compared festival ranking from 2012 to 2013 to predict 2013 set times for Outside Lands and Austin City Limits. For some ticket-pricing information, for shows held before 2013, we adjusted for inflation. Nine Inch Nails’ last performance, for example, was in 2009. We assumed that a headlining show, on average, is one and a half hours long, and so we adjusted the value of a festival set accordingly. A one-hour set at the festival meant a lesser value than that of their regular headlining shows. Lollapalooza’s value is pretty evenly spread from the top of the bill to the bottom. Unlike Outside Lands, which seems to have spent most of its cash on Paul McCartney, Lollapalooza went for relatively inexpensive headliners and a solid set of subheadliners. In fact, many of the headliners are actually of lesser value than lower-ranked artists. New Order, a subheadliner this year, beats both the Killers and Mumford & Sons: respectively, they’re valued at $69.18, $60.38 and $57.46. It’s Steve Aoki, the DJ upstart, who comes away with an upset. As you can see in the table above, Aoki’s valued at $72.88. He’s the third-most valuable act on the lineup, just after the Cure and Nine Inch Nails, although he’s ranked 17th on the actual festival bill. Aoki’s high showing is indicative of a larger trend at Lollapalooza: a lot of the high-value acts are EDM artists, who will perform at Grant Park’s special stage for electronic music: Perry’s. Many of these artists may not ever produce a platinum-certified record like the Cure or Mumford & Sons, but they do move tickets like crazy and demand a premium for every show. Paul McCartney is number-one on the lineup at Outside Lands and in value, too, by a longshot. We value his shows at $154.33. The next highest value is for D’Angelo, who, on his comeback tour, asks for an average $89.40. That’s half the value of Mr. McCartney, which make pretty clear: If you’re deciding between these three fests, Outside Lands is probably only a good deal if you want to see Paul. Austin City Limits boasts a pretty consistent bill and the highest net value: $641.66. That’s the overall value – the gross value – minus the cost of a $225 ticket. Unlike with Outside Lands – and, to some extent, Lollapalooza, too – at ACL, values are pretty consistent from top to bottom. Top value goes to The Cure, who, on their most recent U.S. tours, have asked for an average $103 per ticket. Next is Lionel Richie, at $95.54, D’Angelo at $89.40 and Depeche Mode at $89.82. Find the value of your own festival experience! Below, you’ll find average values for every band on the lineup, from most valuable to least. But before you add up all these numbers, for each band you’ll see, check out the formula just after the table. 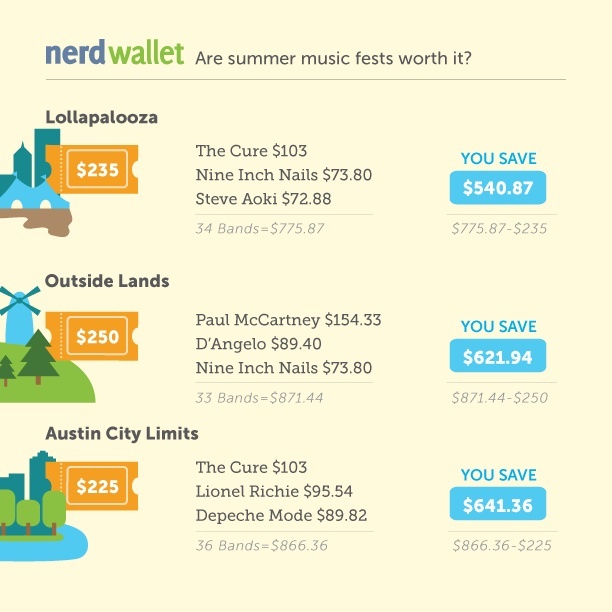 Do that math, and you’ll be able to estimate the dollar value of your festival experience. We assume that third variable, the length of a band’s headlining show, to be an hour and a half. Note: Unless stated otherwise, the artist values cited above, in the body of our article, are those for their headlining shows, on their own tours. In computing the value of a festival ticket, we thus adjusted for the length of their set – it’s often shorter at a festival.